I’ve never written a ‘trip report’ of any kind so please bear with me for this post! 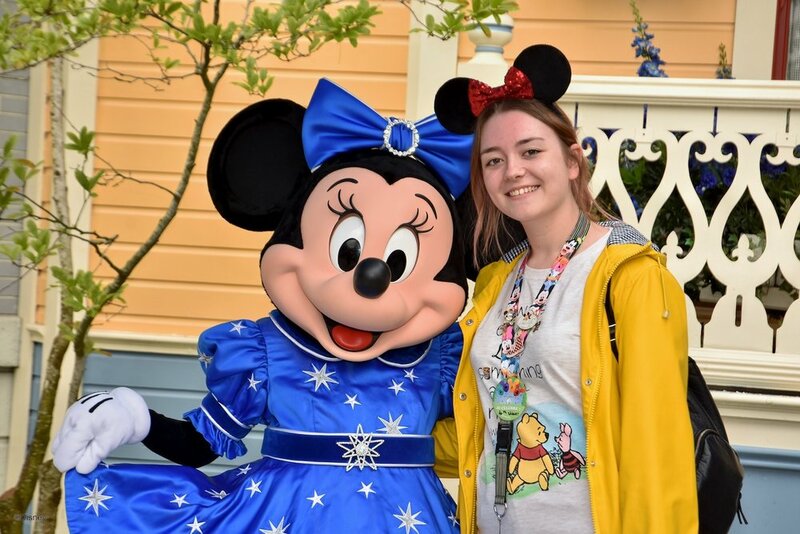 I have seen so many different trip reports on the Disneyland Paris for Brits Facebook Group so I thought I would attempt to write one of my own. 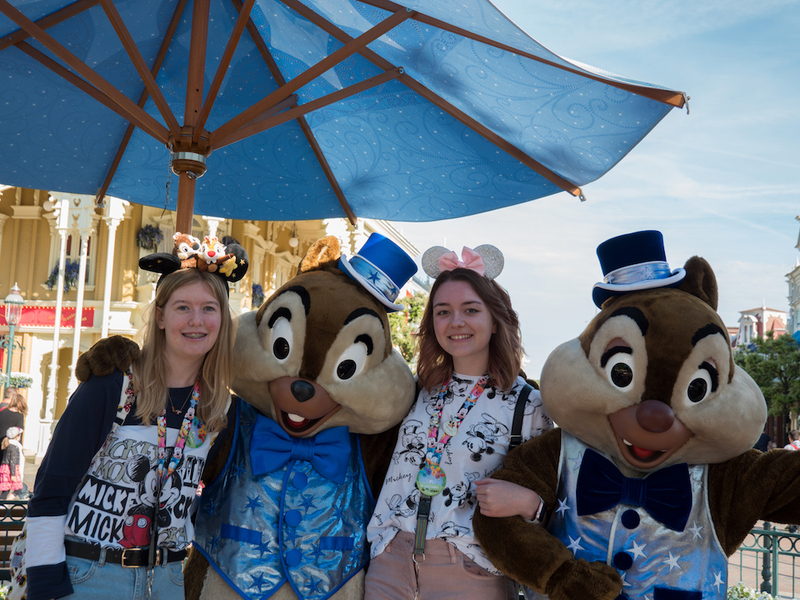 I would 100% recommend that if you are going to Disneyland Paris soon and you need some specific advice, join the Disneyland Paris for Brits Facebook Group. Everyone in the group is really helpful and friendly so if you have any questions that I can’t answer then that is definitely the best place to head. I am going to try and include as much detail as I can about my trip including a few tips. Hope you enjoy the post even if it is a rather long one! We flew from Newcastle Airport at 6:25am on the Monday morning and landed in Charles de Gaulle airport at 9:00am local time. As we live about a 45 minute drive from the airport, we decided to stay in the airport Premier Inn the night before. We went to the Premier Inn on the Sunday and had a walk over to airport, had tea and had an early night. The flight time meant that we had to be at the airport for about 4:25am which meant that we had to get up about 3am Monday morning which felt as early as it sounds! We flew from Newcastle Airport at 6:25am on the Monday morning and landed in Charles de Gaulle airport at 9:00am local time. I have been to Disneyland Paris before but only ever with my family. I wasn’t sure how I would find navigating the whole airport process without them but it went perfectly fine. We checked in, checked in our baggage and went through security with plenty of time to spare. We definitely got quite a lot of attention in our Minnie Ears, Disney jacket and top. 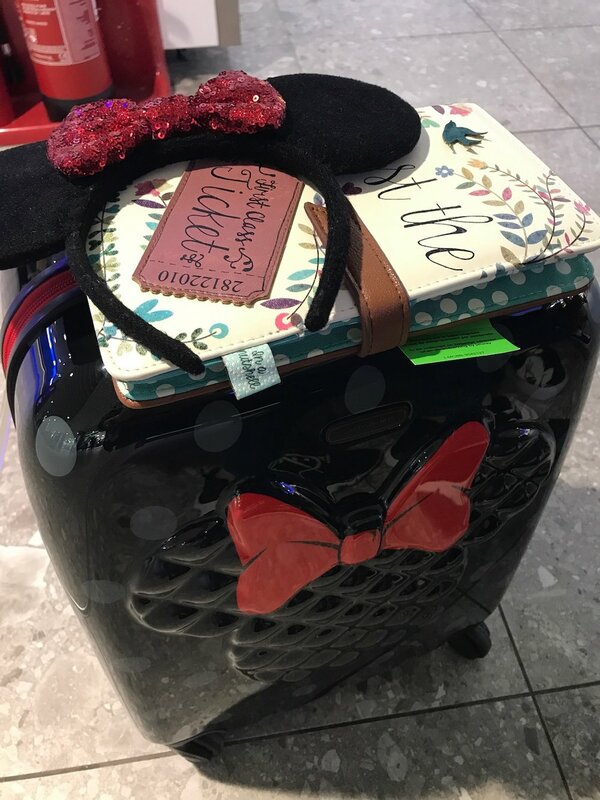 A few people mentioned our clear love of Disney in the airport, including the guy in security who pointed out my clear love of Disney when he saw me with my Minnie Mouse suitcase. We arrived at Charles de Gaulle on time which was great. The flight was really quick and easy but the queue for passport control wasn’t so quick! It took a while to go through passport control so I would be prepared for that if you are heading to Paris anytime soon. Luckily our luggage had already arrived when we went to collect it and it was really easy to find the Magical Shuttle pick up point. It did end up taking a while to get to the hotel because of traffic. We arrived at the hotel about 12 lunchtime and went to check in. I would 100% recommend you get an early flight as it meant we had quite a lot of our first day to enjoy the parks, it was worth the very early start. We stayed for 4 nights 5 days in the Santa Fe Hotel from Monday to Friday. When we arrived at the hotel we joined the rather long line for check in. We gave a cast member the confirmation of our booking and then we were given a form to fill in with our personal details. We had to fill in the form whilst pushing our luggage along the line which was quite difficult! The cast member at the check-in was extremely helpful and gave us everything we needed. We received our park tickets, our ticket for extra magic hours, our vouchers for the character breakfast and the voucher to exchange for our Photopass. Despite being aware that we wouldn’t have our room until 3pm, the room was ready early. 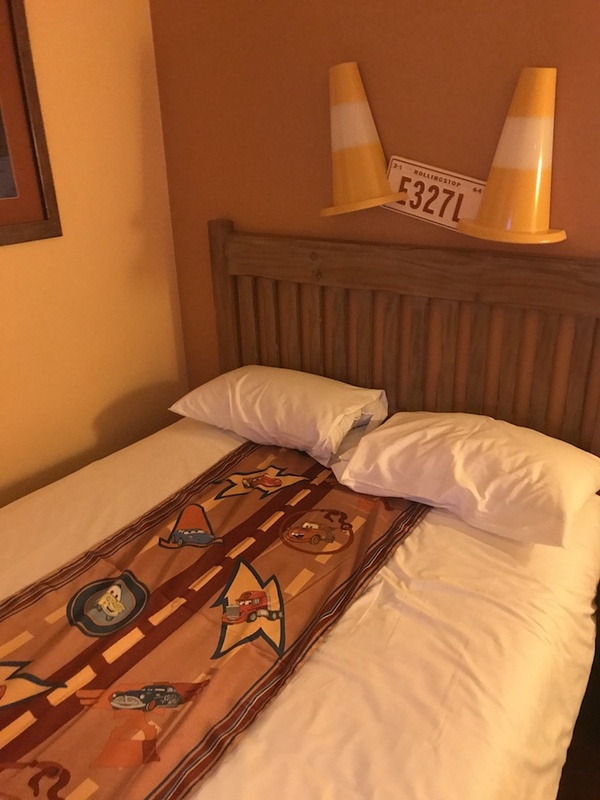 This was really helpful as we were able to go straight to the room and sort out our bags and get changed before heading to the park. Our room was located in the Luigi block. It was just a two minute walk from the reception and shop and was also close by to the walkway to the parks. The walk was only about 15 minutes to the Disney Village which was perfect. We walked to the parks and back nearly every day. We only got the bus back on the Thursday night as it was absolutely pouring down. We also got the bus to the parks on our last morning as we were already at the reception to checkout which was right near the bus stop. The room was a perfect location but as we were on the ground floor you could hear people outside quite often, particularly when people were coming back from the parks on an evening. It wasn’t a particular issue overall and wouldn’t put me off staying there again. The room was clean and had everything that we could have needed. There was plenty of storage for clothing etc. We had 10 hangers between us which was a perfect amount, but had there been more people in the room we would have had to request more. There were three large drawers of which we only needed to use two for everything we brought as they had so much space. The safe worked perfectly and was a good size. There was a hairdryer in the bathroom which worked well on my rather thick hair. 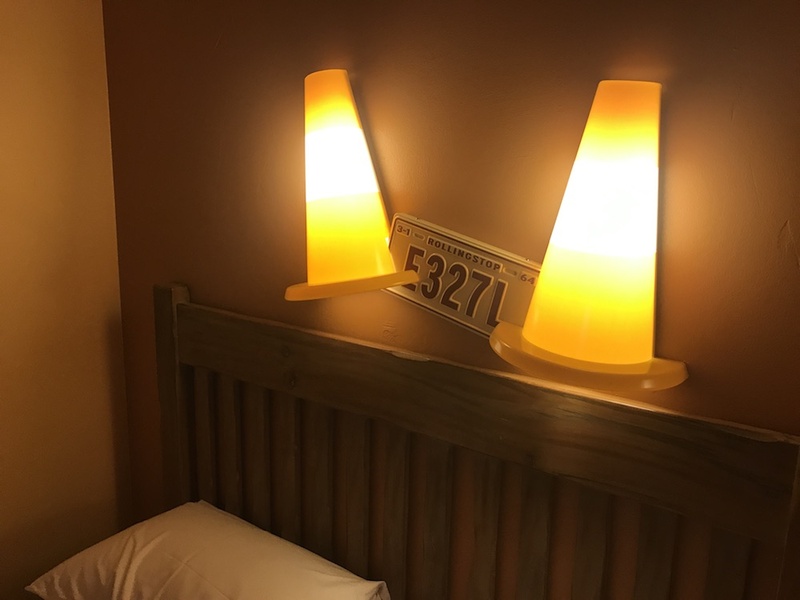 I didn’t notice an iron or ironing board in the room. The bathroom was a good size and came with plenty of towels for the two of us and were replaced daily. I loved the mirror in the bathroom! 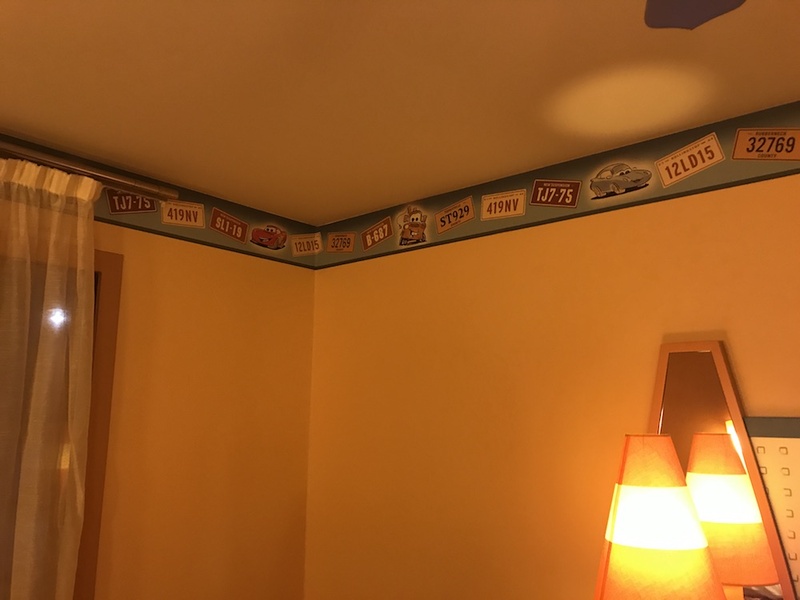 I loved all the details in the room, perfect for a Cars fan of course. They even had Life is a Highway from the film playing outside the reception which I was very happy about! We had a double bed each with two pillows. We both sleep with two pillows so if there had been more than two of us we would have had to request more pillows. The bed and pillows were both comfortable and I had no issues sleeping in the room. 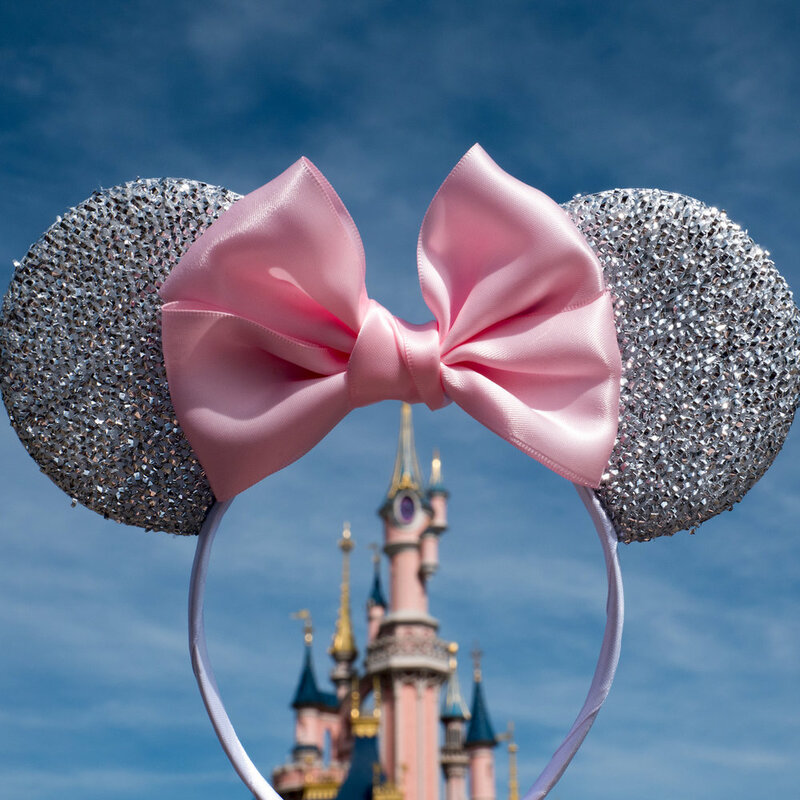 We wanted to get everything we could done that we could during our 4 nights, 5 days in Disneyland Paris. We had the afternoon and evening on the Monday and could only spend magic hours in the parks on the Friday. We had 3 full days, the Tuesday, Wednesday and Thursday. It definitely helped having a lot of our first day in the parks due to our early flight time. Before we went we had a rough plan where we wanted to be each day, during the trip we stayed flexible in what we wanted to do each day, mainly depending on the weather. It is worth looking at the show schedule before your trip which is released every Friday for the following week. 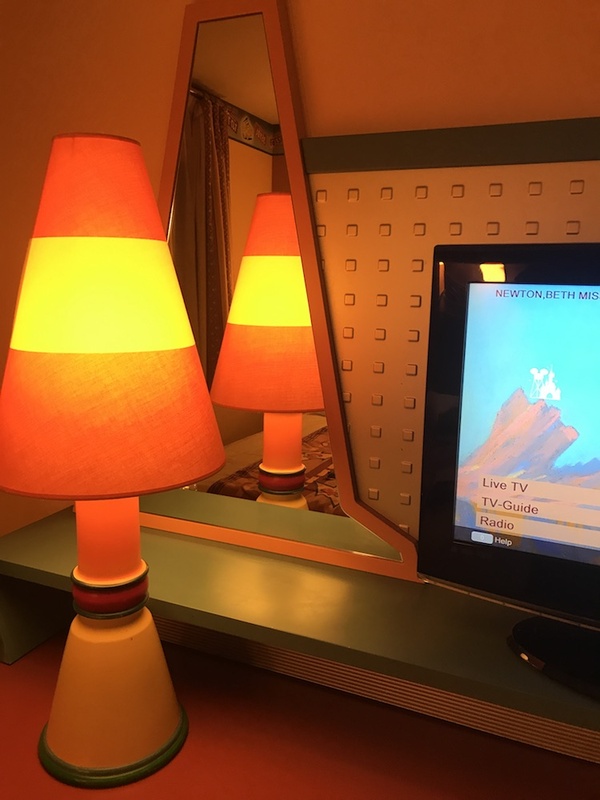 We found it helpful to know when the shows we wanted to see would be on during our stay so we could plan around them. 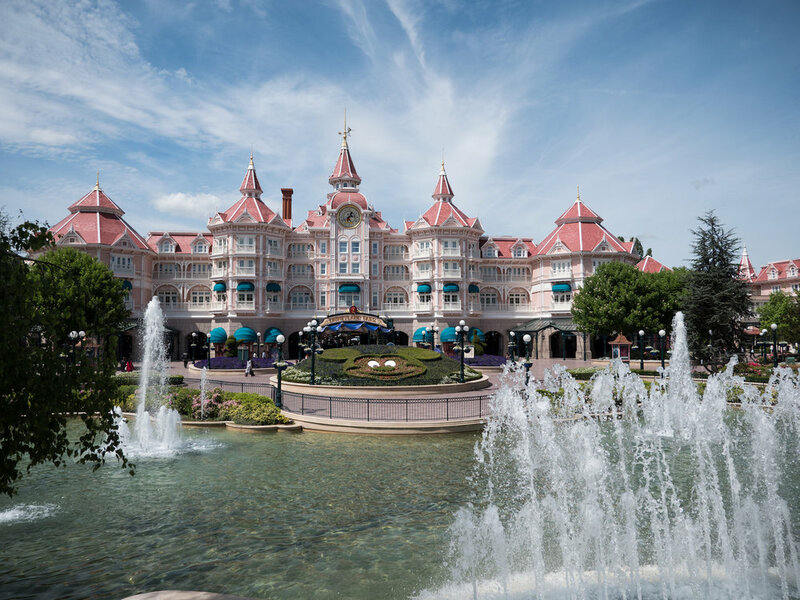 For the first day we stayed in the Disneyland Park. We had some lunch in the Disney Village on our way in and bought our basic merchandise (lanyard, autograph book etc.) whilst in the Village. We headed for Disneyland Park stopping to take various photos on the way, we spent a lot of time doing this as Disney is too pretty not to photograph! I had totally forgotten how stunning the Disneyland Hotel is. It is absolutely beautiful. I would love to stay there again one day. Our first ride was the teacups (one of my personal favourites!) and we also watched the parade on our first day which starts at 5:30pm every day. I have done a blog post previously showing my photographs from the parade and I also shared the places we watched the parade from, you can read the post here. We got plenty of rides done on our first day including one of my personal favourites, Buzz Lightyear Laser Blast! We didn’t watch the fireworks on the first night so we decided to use the opportunity to do a few rides and head back early as we were pretty tired after our early start. The second day we decided to head to the Walt Disney Studios for opening. The studios opens later than the Disneyland Park, opening at 10am. We headed out about 8:30 hoping to get there for just before 10. We ended up getting there not long after 10 after being distracted by a shop or two. It proved pretty difficult to walk through the Disney Village without going in at least one shop. We managed to get a lot of the rides in the Studios that we wanted to do. We started with Cars Quatre Roues Rallye as it had just a 10 minute wait. We then headed to Ratatouille for a fast pass. 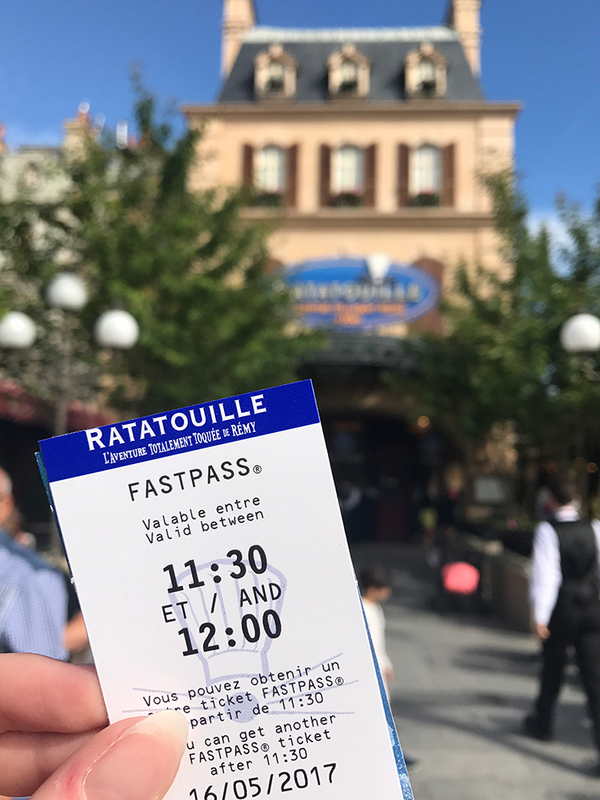 The ride times for Ratatouille quickly reached 60+ minutes so I would definitely recommend a fastpass. We decided to do some of the rides in Toy Story Land whilst we waited for our return time. I love the theming of Toy Story Land, it is one of my favourite areas in Disneyland Paris. Definitely makes me excited for Walt Disney World to open Toy Story Land. We headed back to Ratatouille which was amazing, one of my favourite Disney rides for sure! We managed to go on a lot of rides in the Studios including Toy Story Land, Ratatouille, Tower of Terror, the Studio Tram Tour and watched Moteurs… Action! Stunt Show Spectacular by 3pm. The Stunt Show will always be one of my favourite things to do in Disney, I’m still disappointed they removed it from WDW. We decided to head back later in the week to finish off the last few rides and shows we didn’t have time for. We had early tea/late lunch in the Studios and headed back to the hotel for an hour or so before going back out to Disneyland Parc for the fireworks. On the way through the Disney Village to go into Disneyland Park, we decided to go on the PanoraMagique hot air balloon which I really enjoyed! However, I wouldn’t do it again personally as it doesn’t last that long for the €12 per person cost. I think it only needs doing once, but I am glad I have done as it has always been one of those things I have wanted to do. The view of the castle from the hot air balloon! We went on a few rides in Disneyland Park and then we bought a hot-dog from Caseys and waited about an hour for the fireworks to start. I loved the fireworks, whilst they weren’t entirely what I was expecting they are definitely a must do. Day Three was the nicest weather of the week and by nice I mean boiling! We had character breakfast at Plaza Gardens booked for 9:45 so headed to Disneyland Park for the start of magic hours. We met Chip and Dale when we first went into the park. They were such a fun meet, they are so cute and cheeky! They would always be on my list to meet when visiting Disney. The queue went quite quick so we went to take some photos under the castle before we went to the character breakfast. 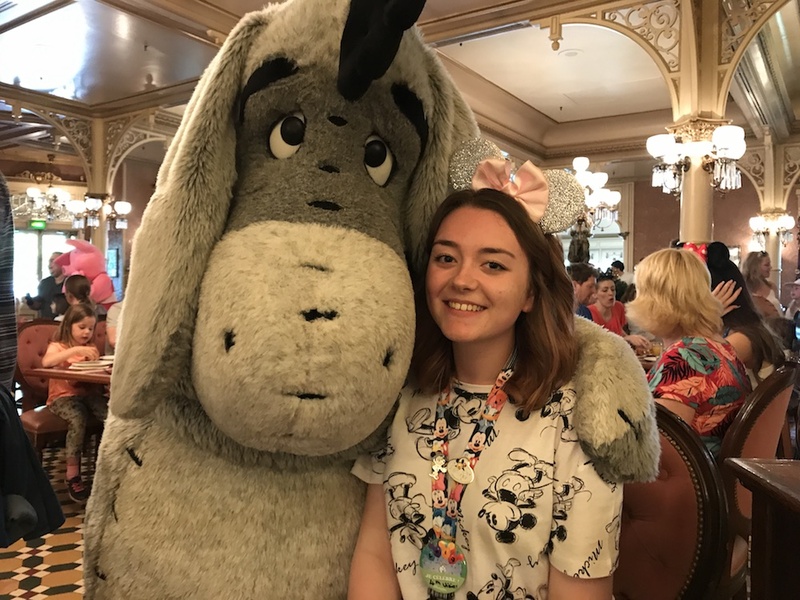 I posted here about my experience eating in Disneyland Paris with a nut allergy, if you go back and the post you can find out what I thought of the character breakfast. 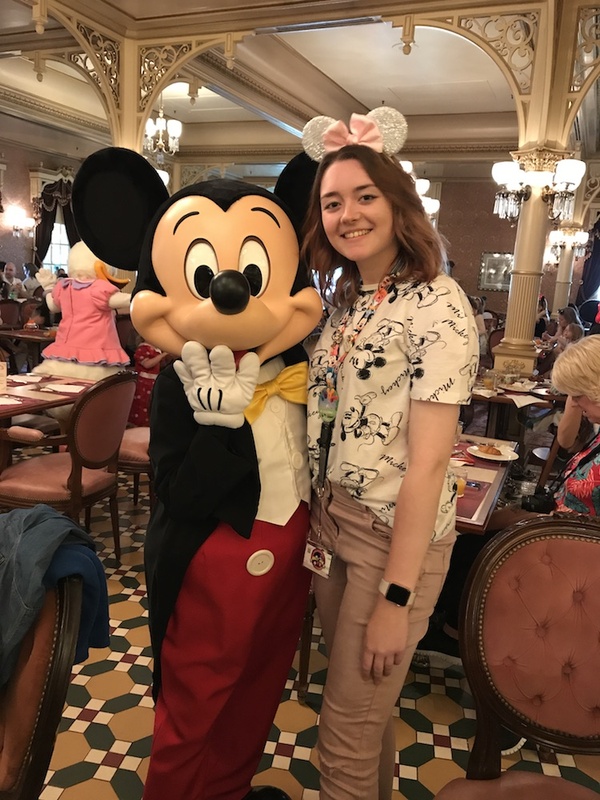 My favourite part was definitely meeting Mickey Mouse because who doesn’t love Mickey Mouse! Eeyore was also a personal favourite, he’s just too cute not to love. We went on a few more rides and then we sat down to watch the two shows by the castle. I will be posting blog posts of the photos from both shows soon! The Happy Anniversary Disneyland Paris show was one of the highlights of the trip for me. Definitely a must-do if you are heading to Disneyland for the anniversary. We decided to go and do some more attractions including the Tree House which I had never done before. We also stopped to meet Jessie along the way but headed back to the hotel earlier than we had planned as we were both shattered from walking round all day in the heat. We decided to wander round the shops along Main Street and in the Disney Village instead of staying in the park for a more relaxed evening. If you want to see my purchases (there are a lot!) 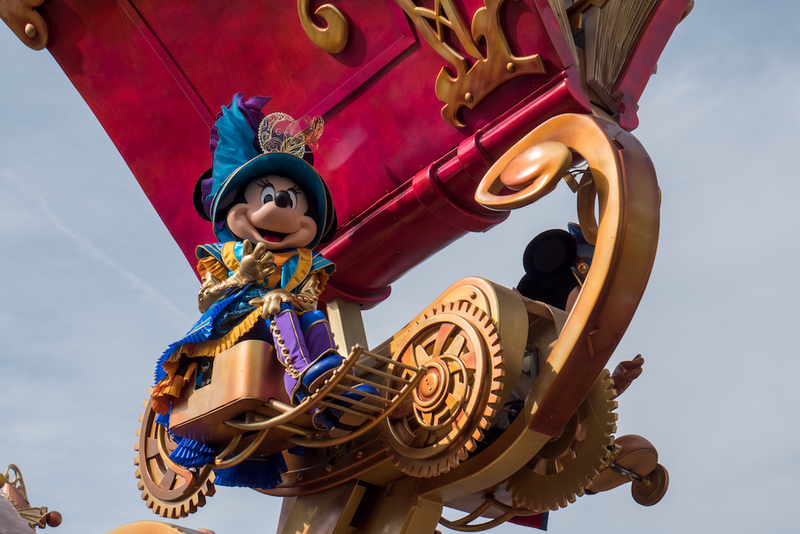 then be sure to read my read my Disneyland Paris Haul post, here. I just want to say a massive thank you to everyone who liked that photo. I love sharing my photographs on Instagram and anywhere near 100 likes and I am over the moon. 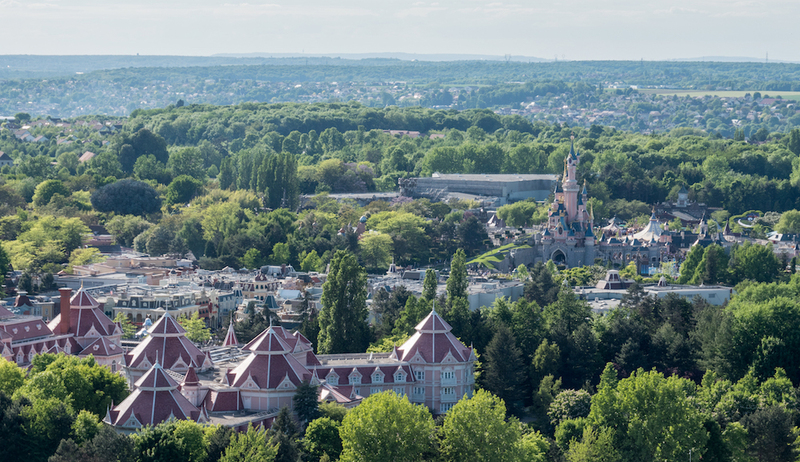 So to see a photo I really loved, be commented on by Disneyland Paris and to wake up the next day and see that it has 1000+ likes was just absolutely amazing. I can’t tell you how much I appreciate everyone who supports my blog and my Instagram. I’m glad everyone liked the photo as much as I did. Day Four we headed back to Disneyland Park once again this time for magic hours. 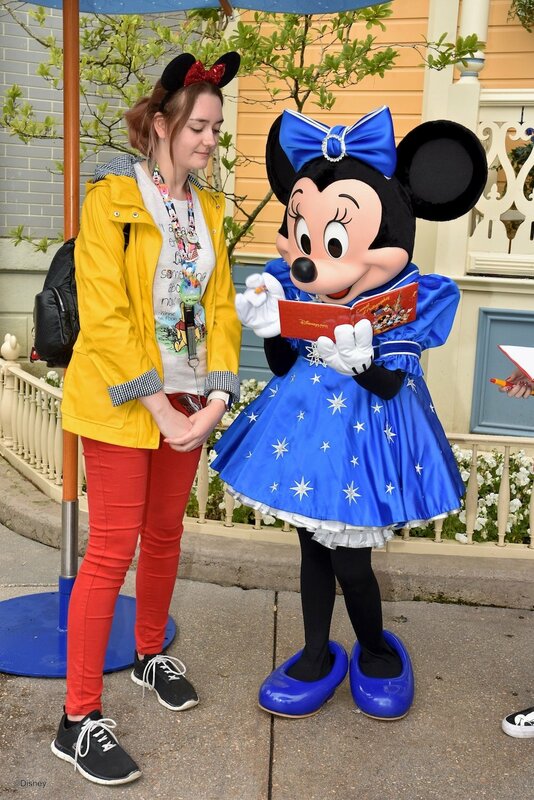 We met Minnie Mouse which was such a good meet. I love the photos from the Photopass photographer. I will be posting about my thoughts of the Photopass later in the week. We then walked round the park taking some photos. If you hadn’t already noticed from my blog and Instagram, taking photos was a big part of this trip. We went on a few rides in Disneyland Park before deciding to head to the Walt Disney Studios for opening. We were at the Studios just a few minutes after opening and headed straight to Tower of Terror which we practically walked on. Tower of Terror was one of my favourite rides during the trip. I can’t wait to ride it in Florida when we go in October! Opening of the park is definitely a good time to go we found. Although, we noticed that Crush’s Coaster seemed to have a long wait regardless of the time of day. 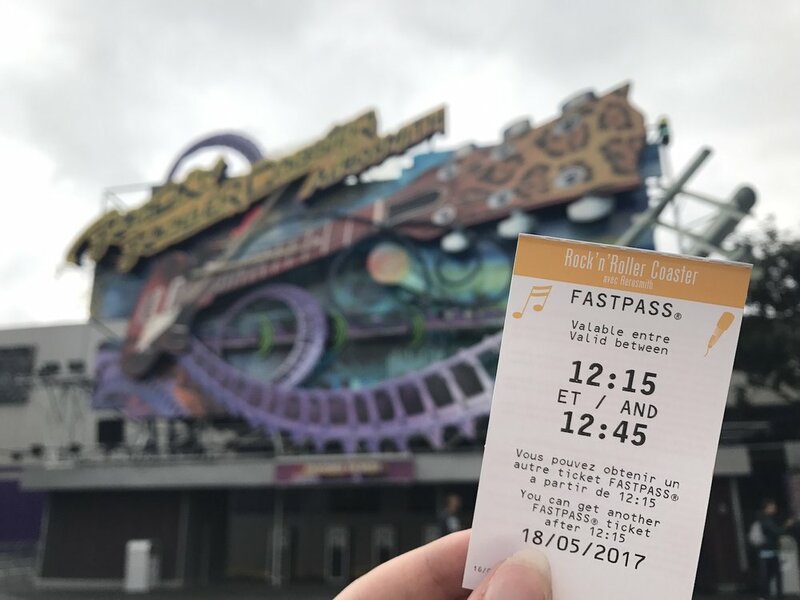 After Tower of Terror we headed to Rock’in Rollercoaster and again walked on as it was just a 5 minute wait. We both loved the ride so much we got a fastpass to go back on. We went on a few more rides and watched Stitch Live and Mickey and the Magician. We decided that we would just wait the 40 minute wait for Crush’s Coaster as this was the lowest we had seen it so far. The wait ended up being about 30 minutes and felt really quick, so I wouldn’t be too put off by the long wait time. It was also worth waiting half an hour for in my opinion. We headed back to the hotel for a bit after doing everything in the Studios. I wasn’t sure what I would think of Walt Disney Studios as Disneyland Park is so magical. I actually really enjoyed the Studios, it definitely has some of the best rides even if it does lack a little bit of extra Disney magic. The plan was to watch Illuminations again with it being our last night but the weather had other ideas. We arrived in Disneyland Park and after a few rides we could tell it wasn’t going to be long before it started to rain. It started to rain quite a bit before we went into Casey’s Corner. By time I had eaten my meal, it had started to absolutely pour down. Soaked through, shoes full of water kind of rain. We went on a Buzz Lightyear and Space Mountain before admitting defeat and went back to the hotel. Top tip, take some form of spare shoes because my shoes ended up absolutely soaked even after a blast from the hair dryer and being left out over night. Our last day in Disney had come. We finished packing and took our suitcases to the Luggage Hold in the hotel. We handed in our room keys and got the bus to Disneyland Park. We spent a lot of time just walking around and taking photographs as it was our last time in the park. We went on a few rides, indoor ones as it was so cold! We waited until 10 when the park officially opened and went on Phantom Manor one last time and then headed to Fantasyland for our final ride, Its a Small World. We decided to walk back to the hotel so that we could quickly stop at McDonald’s for something to eat. We collected our luggage and sat and waited to go to the airport. We had booked the Magical Shuttle to take us to the airport. Our flight was at 3:10pm and we were told by the hotel to take the 12:25 bus back to the airport. We decided to get there early so we could sort out our bags and be there ready if the bus arrived early. Which it did. The bus was about 10 minutes early and by 12:25, the time it was meant to leave, we were already on our way to pick up the guests from other hotels. Our trip to Disneyland Paris had come to an end. It was a magical trip and I already can’t wait until the next time I go. The countdown is officially on for my trip to Walt Disney World in October which is definitely helping the Disney Blues! I hope you enjoyed my trip round up even though it was a rather long post! 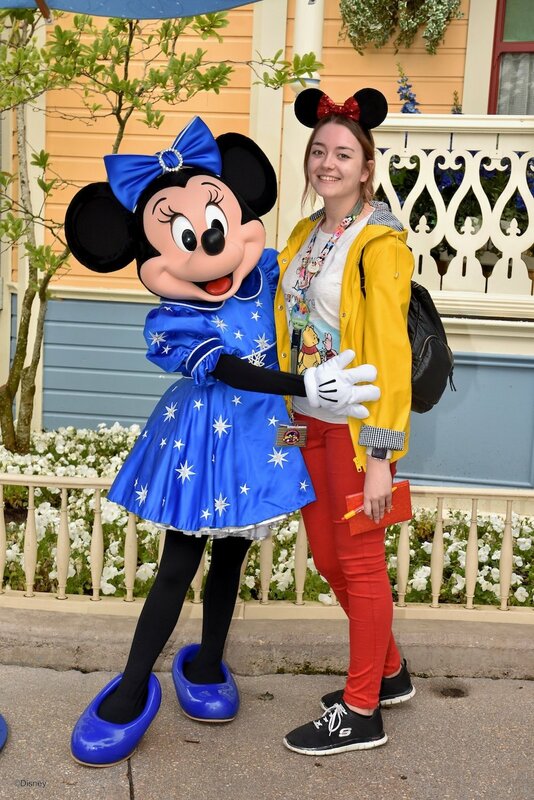 We had the best time in Disneyland Paris and I am already missing the magic of Disneyland.